American Ambassador to Syria Robert Ford just fled the country after threats to his safety were made. For the past two months, the American Embassy in Damascus has been using Facebook to criticize the Syrian government and to offer a free space for dissidents. Robert Ford, the American ambassador to Syria, slipped out of the country on Sunday after credible threats were made against him. Ford and the Damascus embassy staff have been posting extensive content criticizing Syrian president Bashar al-Assad to Facebook and offering public sympathy for Syrian rebels. 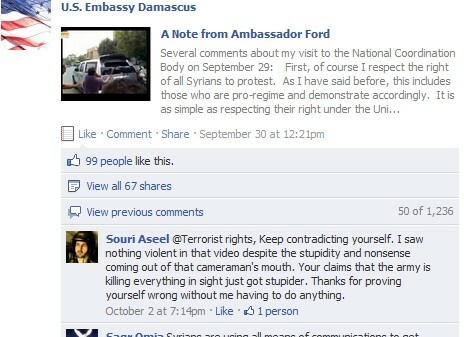 The ambassador’s departure is not exclusively due to Facebook use, of course. However, Mark Zuckerberg’s popular social network played a key part in the American government’s anti-Assad strategy. Visitors to the U.S. Embassy Damascus Facebook page can find numerous examples of content that are bluntly anti-Assad and anti-Ba’ath (the ruling party in Syria). For those used to the muted language and semiotic hair-splitting of most State Department communications, the blunt tone of the Damascus Embassy page is shocking. More importantly, the State Department lets a vibrant community of Syrian Internet users leave comments in Facebook threads which are often virulently anti-American and anti-Assad. The State Department also employs a moderator with previous Middle Eastern postings, Leslie Ordeman, to oversee the page. In one Facebook post, Ford defended visiting the Syrian rebels’ National Coordination Body and wrote an extended article with numerous responses to individual Facebook users. The long comment thread that followed the article (approximately 1,200 messages at press time) consists of primarily English-language debate about the Assad regime where users regularly began accusing each other of being Internet sock puppets for either the American or Syrian governments. Mujtaba Xr warns me that I will face being killed if I continue my criticism of the repression in Syria. 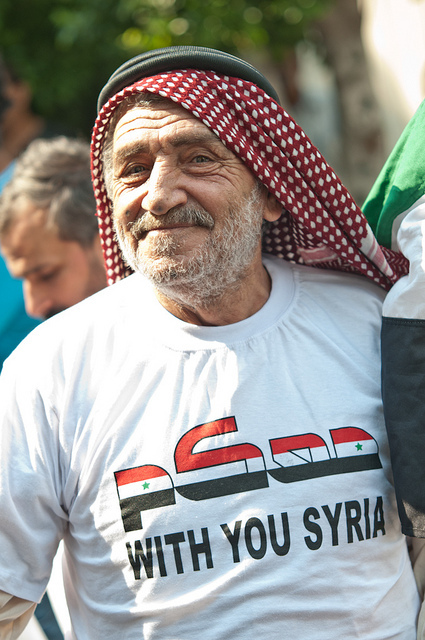 I take his post to be a perfectly good example of the kind of intolerance that has provoked such discontent in Syria. Remember that I am one of the few international observers here on the ground; if only the Syrian government would allow international media to move around the country freely like we did in Iraq! American diplomats representing the Damascus embassy also posted links to provocative news articles that implied the Syrian government was violating human rights and offered a comment thread to discuss the Syrian Ambassador to Washington’s CNN interview. 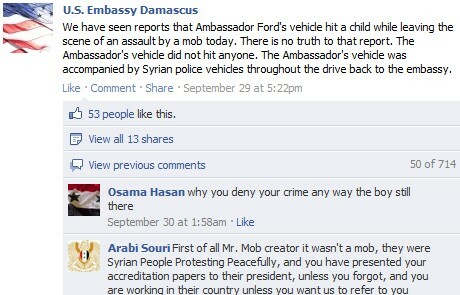 The Syrian embassy staff also took to Facebook to defuse a rumor that a teenager had been killed by Ford’s motorcade in a hit-and-run incident. This certainly falls outside the range of normal public diplomacy for any government. Many of the accused sock puppets from the post previously mentioned also show up here; one thing this reporter found interesting were the numerous Facebook users with Anglo-Saxon sounding names who posted pro-Assad messages in clunky English and who all seem to have friended each other. Somewhere in Damascus, Syrian government employees are likely churning out fake all-American and all-British Facebook accounts as we speak. Other posts by the Damascus embassy on Facebook include everything from an explanation of the Occupy Wall Street movement for Syrian readers and a memorial for Steve Jobs, who was of partial Syrian ancestry through his biological father. Ford was attacked by a Syrian mob in late September and State Department spokesperson Mark Toner said that Ford would be returning to Washington in order to ensure his safety. Fast Company has reported extensively on social media and the Arab Spring and detailed how Syrian rebels turn to YouTube and Facebook to document massacres while the government uses hackers to harass opposition figures.